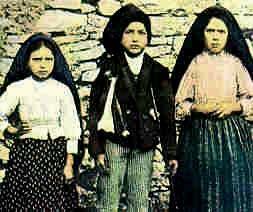 In 1917, the Blessed Virgin Mary appeared a total of six times to three shepherd children in Fatima, Portugal. In the year of 1916 three shepherd children, Lucia dos Santos, age nine and her two cousins, Francisco and Jacinta Marto, age eight and six respectively tended their parents flock of sheep. It was a fine spring morning for grazing sheep on Lucia’s father property. The children played as the sheep feasted on the grass. While still at play without warning a light whiter than the driving snow appeared. As it approached, the light took the shape of a transparent young man. He began to speak, “Fear not. I am the Angel of Peace. Pray with me.” The figure of light knelt on the ground, bowing low and three time recited this prayer: “My God, I believe, I adore, I hope and I love You. I ask pardon of You for those who do not believe, do not adore, do not hope and do not love You.” Then he arose and said: “Pray this way. The Hearts of Jesus and Mary are attentive to the voice of your supplications.” Then the transparent young man disappeared. Once more the Guardian Angel of Portugal prostrated himself upon the ground and again recited three times the Holy Trinity, than disappearing once again. On May 13, 1917 the children were tending the sheep on the same piece of land known as the Cova da Iria. They had finished praying a Rosary, ate some lunch and were beginning to play. Abruptly there was a brilliant flash of light. Fearing a storm they excitedly herded the sheep to head for shelter. Again, there was another flash of light and there before the children appeared the vision of a beautiful Lady. The Lady majestically floated above the branches of a small oak tree. She was all dressed in white and was as radiant like the sun. The children first impulse was to run away but the Lady beckoned them to draw near. Here is the conversation on May 13, 1917. After a few moments the Lady spoke again saying, “Pray the Rosary, every day, in order to obtain peace for the world, and the end of the war.” The Lady drifted off to the East and disappeared. In the following days and months there was great concern in the little village of Fatima. People from near and far poured into the tiny hamlet. As news of the apparition spread it reached authorities of the communistic ruled government. The three shepherd children were beginning to experience the sufferings the Lady had spoken of. Once again the children were to receive the ray of light as before. Lucia writes; Jacinta and Francisco seemed to be in that part of the light which rose toward heaven, and I in that which was poured out on the earth. In front of the palm of the Lady’s right hand was a heart encircled by thorns which pierced it. We understood that this was the Immaculate Heart of Mary, outraged by the sins of humanity and seeking reparation. (Lady) ‘To prevent this, I shall come to ask for the consecration of Russia to my Immaculate Heart, and the Communion of Reparation on the First Saturdays. If my requests are heeded, Russia will be converted, and there will be peace; if not, she will spread her errors throughout the world, causing wars and persecutions of the Church. The good will be martyred, the Holy Father will consecrate Russia to me, and she will be converted, and a period of peace will be granted to the world. In Portugal, the dogma of the Faith will always be preserved; etc.… Do not tell this to anyone.’ (Lucia) “To Francisco?” (note: Francisco was only able to see the Lady not hear her words) (Lady) ‘Yes, you may tell him. When you pray the Rosary, say after each mystery, O my Jesus, forgive us, save us from the fire of hell. Lead all souls to heaven, especially those who are most in need. After this there was a moment of silence, (Lucia) “Is there anything more that you want of me?” (Lady) ‘No I do not want anything more of you today.’ Then, the Lady ascended towards the East and disappeared. Note: The apparition did not take place on the 13th as the children were taken into custody by the local authorities. Lucia recalls the date as being August 15. At the time of the apparition the children were tending sheep on a piece of land called, Valinhos. (Lady) “Continue to pray the Rosary in order to obtain the end of the war. In October Our Lord will come, as well as our Lady of Dolours and Our Lady of Carmel, Saint Joseph will appear with the Child Jesus to bless the world. God is pleased with your sacrifices. He does not want you to sleep with the rope on, but only to wear it during the daytime.” (Lucia) ‘I was told to ask you many things, the cure of some sick people, of a deaf-mute….’ (Lady) “Yes, I will cure some, but not others. In October I will perform a miracles so that all may believe.” And the Lady disappeared into the East as usual. (Lucia) “What do you want of me?” (Lady) ‘I want to tell you that a chapel is to be built here in my honor. I am the Lady of the Rosary. Continue always to pray the Rosary every day. The war is going to end, and the soldiers will soon return to their homes.’ (Lucia) “I have many things to ask you: the cure of some sick persons, the conversion of sinners, and other things…’ (Lady) ‘Some yes, but not others. They must amend their lives and ask forgiveness for their sins.” Looking very sad Our Lady said, (Lady) ‘Do not offend the Lord our God any more, because He is already so much offended.’ Lucia write; “Then, opening her hands, she made them reflect on the sun, and as she ascended, the reflection of her own light continue to be projected on the sun itself. Here, Your Excellency, is the reason why I cried out to the people to look at the sun, because I was not even aware of their presence. I was moved to do so under the guidance of an interior impulse. Suddenly, as if arrested in its downward plunge by an invisible Heavenly hand, it poised from a moment and then, in the same series of swirling motions it began to climb upward till it resumed its accustomed place in the heavens. Gone was the silver disk with the brilliant rays. It was once more a ball of fire at which nobody could look directly with unshaded eyes. During that day drenching rains had left an estimate 70,000 pilgrims soaking wet. The apparition site, was a pit of mud. After the miracle the weather was beautiful. While the people looked at one another, still trembling from their terrifying experience and not yet sure that some further disaster would not overtake them, a cry of astonishment was heard on every side. The rain-sodden garment had suddenly dried, someone said out loud, and the muddy pit of land was also dry.